For someone who loves making sausages, gifting him/her the vertical sausage stuffer is a great idea. A game hunter will also love this gift. 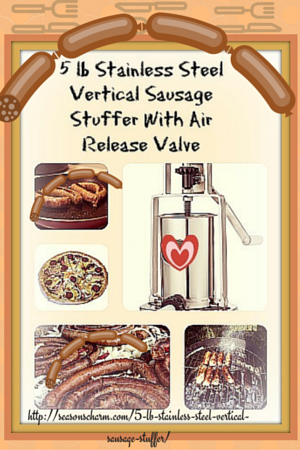 The vertical sausage stuffer makes a wonderful housewarming gift too. When you make sausages at home, you can control the amount of salt, fat and seasonings. There are no preservatives added. Homemade sausages are certainly healthier. A vertical sausage stuffer comes with gears and a cylinder that makes it easier to stuff your sausages. The piston has an air release valve for pushing air bubbles out through the top of the cylinder instead of down into the casings, thus ensuring air bubbles free sausages. Being upright, the machine is more compact compared to the horizontal shaped sausage maker. Make your loved ones feel extra special with your delicious and healthy homemade sausages. 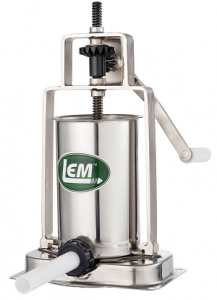 This Lem 5 lb vertical sausage stuffer comes with a stainless steel base and cylinder as well as all metal gears. Metal gears are more durable than plastic ones. The cylinder can be easily removed when you’re filling or when you need to clean up the sausage maker. The package includes 3 stuffing tubes which are 1/2″, 3/4″, and 1″. If you wish to make a more skinny sausage using 21 mm casings, then you have the option to buy the stainless steel 3/8″ stuffing tube. The plastic piston comes with air release valve to minimize air bubbles in your stuffed sausages. It works by pushing the air out through the top of the cylinder and not into the casing. Getting the right meat consistency helps too where air bubbles are concerned. The meat flows beautifully into the casings with no air pockets. 2 clamps are included for a secure clamping onto your counter top or table. This quality sausage stuffer with hand crank will allow you to crank out 5 pounds of sausages in about 3 – 8 minutes. If you do more than that, then reloading might take about 2 – 3 minutes. About 20 – 25 minutes is more than enough to have you churning out 20 pounds of sausages. One customer has commented cranking out 5 pounds in only 30 seconds! Practice makes perfect. Compared to the electric ones, this hand crank sausage stuffer allows for total control on the rate of stuffing the meat into the casings. This is certainly faster than the meat grinder sausage stuffer or attachment types. Cleaning up is easy. You can take apart the cylinder, gasket and piston for a thorough cleaning. The piston can be unscrewed for cleaning. Easy to use – meat can be easily pushed into casings, no air bubbles. If you plan on making more than 10 pounds of sausages regularly, then the bigger size Lem 10 lb or 15 lb vertical sausage stuffer might be better options for you. The 5 lb machine is great for making smaller batches. 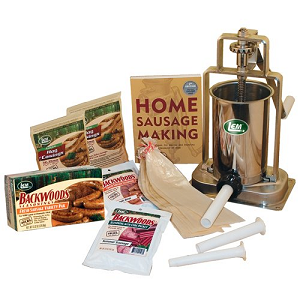 If you are giving the Lem sausage maker as a gift, then the LEM Products Sausage Stuffing Kit might interest you. The kit has everything you’ll need to get started on making sausages. This 3 liter or 5 – 7 lb Vivo sausage maker includes a stainless steel cylinder and a metal base that measures 11 7/8″ x 8 3/4″. The height of the machine is 18.25″ and the cylinder measures 5 7/16″ (diameter) x 7 7/8″. Its all metal, high torque gears make cranking the meat easy. The cylinder can be tilted back for easy filling. There are 4 different sizes plastic tubing included – 10 mm ( 0.4 inch), 20 mm (0.79 inch), 30 mm (1.18 inch) and 40 mm (1.57 inch) in diameter. All are 7″ in length. The 0.4″ tubing would be great for snack sticks, the 0.79″ for pepperoni and bratwurst, the 1.18″ for summer sausages and the 1.57″ for luncheon meats. The included metal piston comes with an air valve that allows for air to escape out from the top instead of through the casings. The handle has been upgraded since its initial release and can now be tightened. Now, there is a wing-screw to lock it onto the shaft. This prevents the handle slipping off during cranking. It comes with 4 rubber footings to minimize movement of the machine while cranking. 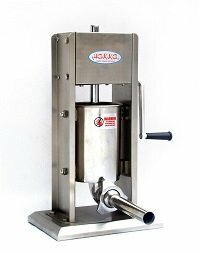 This vertical sausage stuffing machine comes equipped with 2 fill rates system which ensures a smoother and faster operation. You choose between a slow and fast speed for easy stuffing and easy refilling. It has a stainless steel base plate, cylinder, stuffing tubes and Canister. The cylinder tilts back for a more convenient refilling process. The hardened resin gears mounted onto double threaded steel rod ensures smoother operation and better control over the stuffing procedures. The metal piston comes with an air release valve that releases any trapped air upwards away from the casings. The chrome plated steel crank with polypropylene handle is easy to turn. You can easily mount the metal base to most surfaces. The 4 stainless steel nozzles have diameters ranging from 2/3″ (16mm), 5/8″ (22mm), 1-1/4″ (32mm), 1-1/2″ (38mm). All parts in contact with food have SGS food hygiene standard. 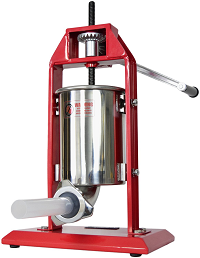 This sausage filler machine measures 12-1/2″ L x 9 W x 22 D and the cylinder has a 5.5″ diameter with a 7.75″ height. The machine comes with 4 plastic feet to prevent slipping. The 5 lb stainless steel vertical sausage stuffer with air release valve makes a wonderful housewarming gift or as a gift to someone special.